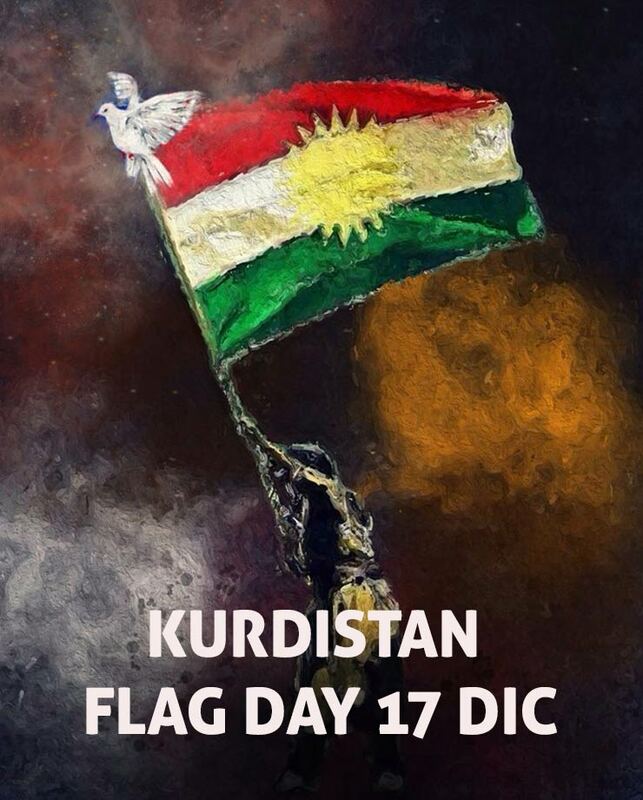 Every year, on December 17th, the Kurdish people in Iraq, Syria, Turkey and Iraq celebrate the day of the flag of Kurdistan. Initially designed by the exiled Kurds of the Kurdistan liberation movement in the early 1920s, the Kurdish flag sees an emblem in the center of the banner, the burning golden sun, which is an ancient religious symbol of the Kurds and represents the wisdom in Zoroastrianism. The solar disk has 21 rays, equal in shape and size. The number 21 is of great importance as it indicates the first day of the New Year, the so-called Nawroz. The colors of the flag also have a symbolic meaning: red symbolizes the blood of the Kurdish martyrs and the ongoing struggle for freedom and independence of Kurdistan; green symbolizes the beauty of the landscapes of Kurdistan; white symbolizes peace and equality; yellow represents life and light. The day of the flag celebration was institutionalized in 2009 when the Parliament of the Iraqi Kurdistan Region passed a law to commemorate the Republic of Kurdistan, better known as the Republic of Mahabad. In 1946, just before it was attacked by the then Iranian government, the president and founder of the Kurdish Republic of Mahabad, Qazi Muhammad, entrusted the flag to the legendary Kurdish leader, then head of the army of the Republic, General Mustafa Barzani . From that moment the Kurds celebrated this day wearing brooches with Kurdish flags and traditional clothes decorated with the bright colors of red, yellow and green. In a message posted on his Facebook page, the former president of the Kurdistan region, Masoud Barzani, said that the flag of Kurdistan "is the symbol of the unity of our people".